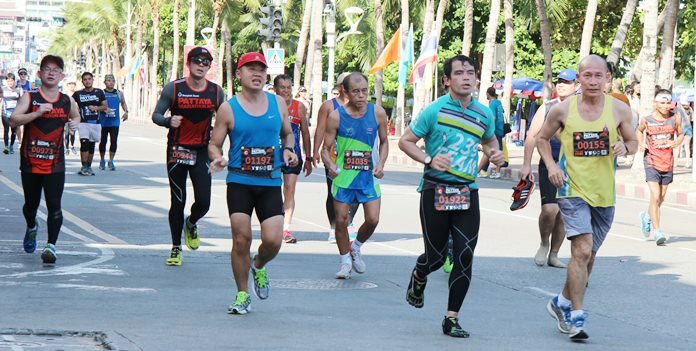 A runner-up in last year’s Bangkok marathon, Noah Chepsergon of Kenya broke through the finishing tape on Pattaya Beach Road last Sunday morning to win the 2016 King’s Cup Pattaya Marathon in a time of 2:39:26 and thus continue the East African nation’s dominance of the event. 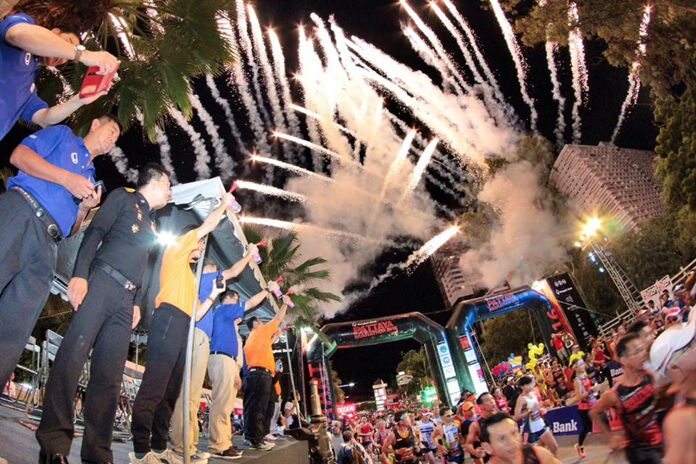 Fireworks explode across the sky as a multitude of runners, joggers and walkers cross the start line on Beach Road during the 2016 edition of the annual Pattaya City Marathon held in the early hours of Sunday morning, July 17. 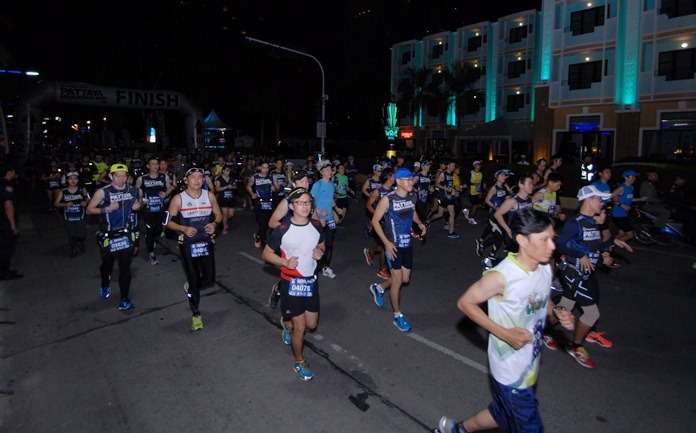 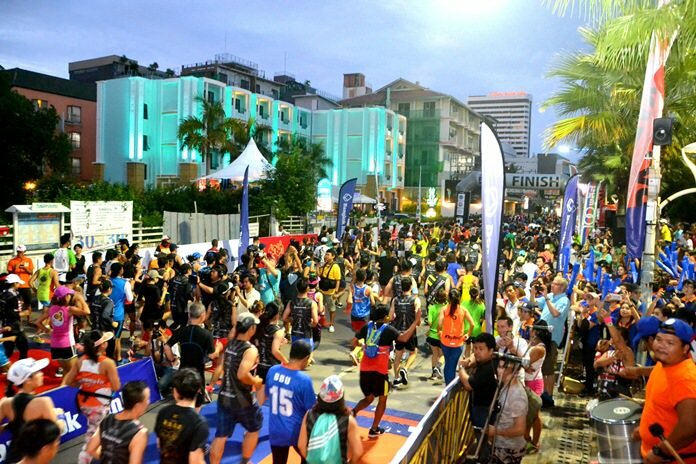 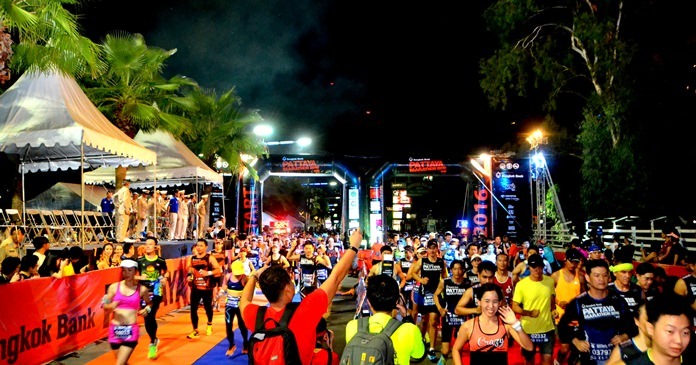 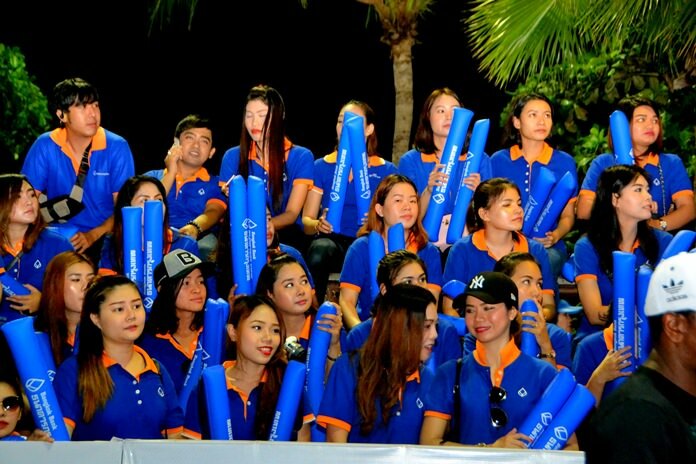 Over 10,000 Thai and international athletes lined up at the start in front of Central Beach shopping mall in the early hours of Sunday, each with their own individual goals to accomplish. 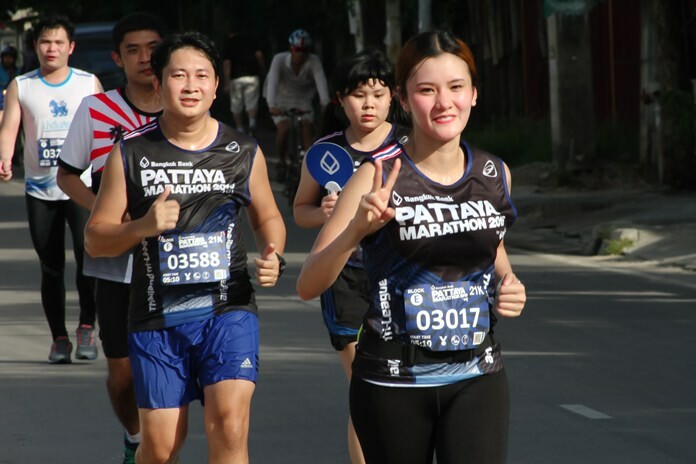 Young and old set to the city streets hoping to set personal bests or just merely to complete the course and all were roared on by enthusiastic spectators along the roadside. 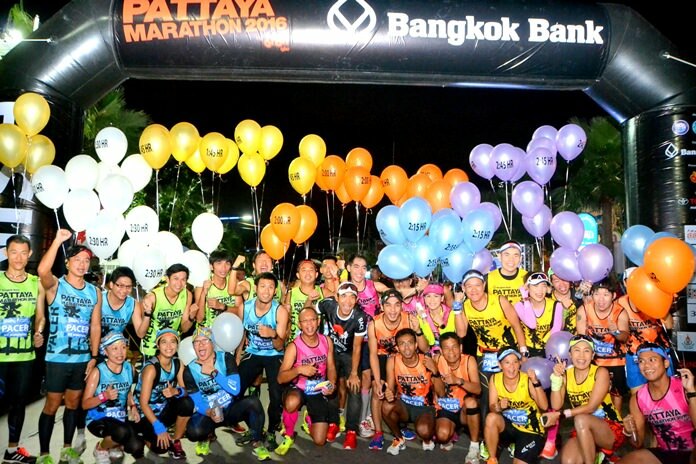 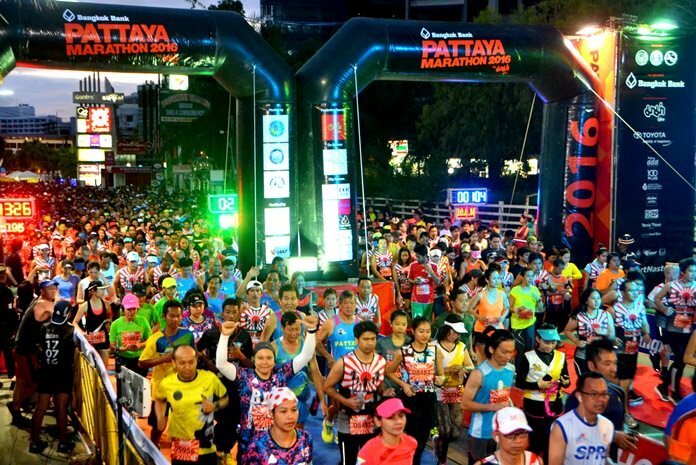 Runners pose at the start line prior to the 2016 Pattaya marathon race. 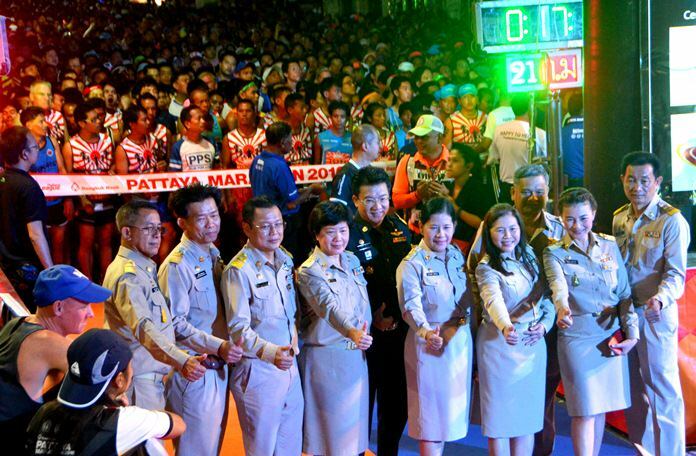 Music, dancers and a cascade of fireworks set the scene as Gen. Chaklit Pong-amorn, president of the Athletic Association Thailand launched the full marathon (42 kilometers) at 03:30 am, followed by Maj. Gen Ampol Buarabporn, commander of Chonburi Police who set the half marathon runners away at 05:10 am and the quarter marathoners at about 05:20 am. 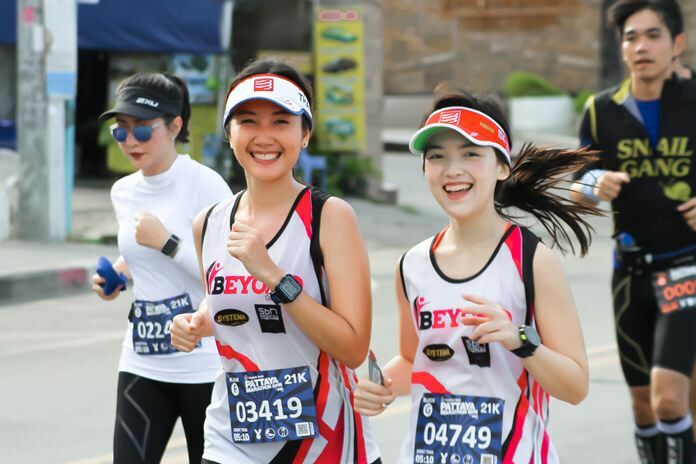 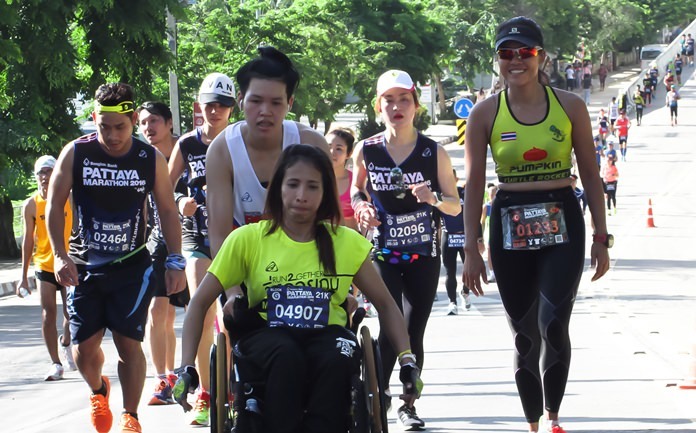 Additional categories included the wheelchair marathon, which was launched at 05:30 am, and the fun-run at 06:30 am. 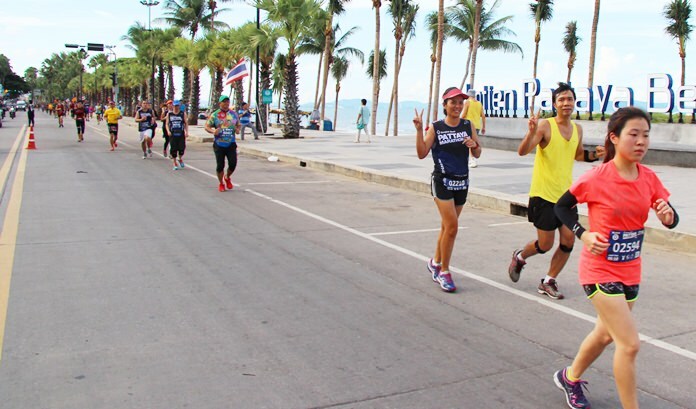 Runners set off in the half marathon race on Beach Road. 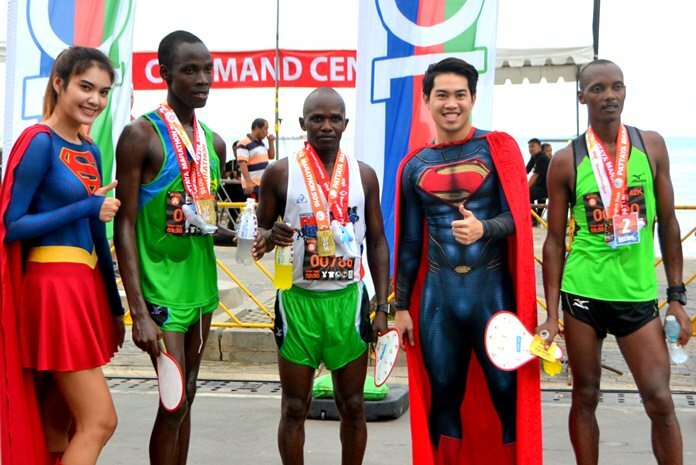 After completing the long, grueling course, Chepsergon was followed across the finish line by his compatriots Thomas Matheka Muli (2:41:22) and John Kipkorir Rutto (2:41:47) who locked out the men’s podium for Kenya. 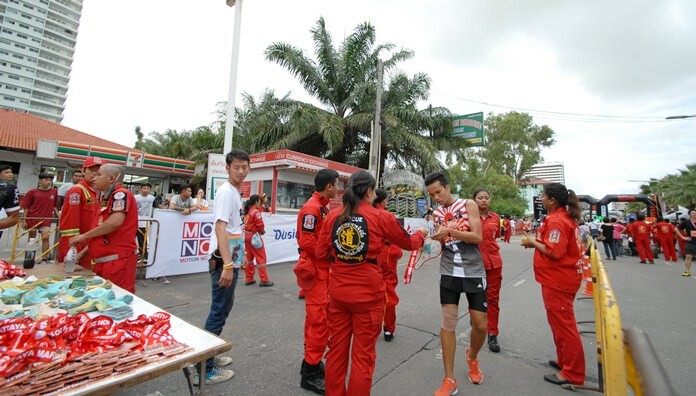 All three were presented with trophies, with Chepsergon taking home the prestigious HM the King’s Cup and 25,000 baht, while second place received 20,000, and third place 15,000. 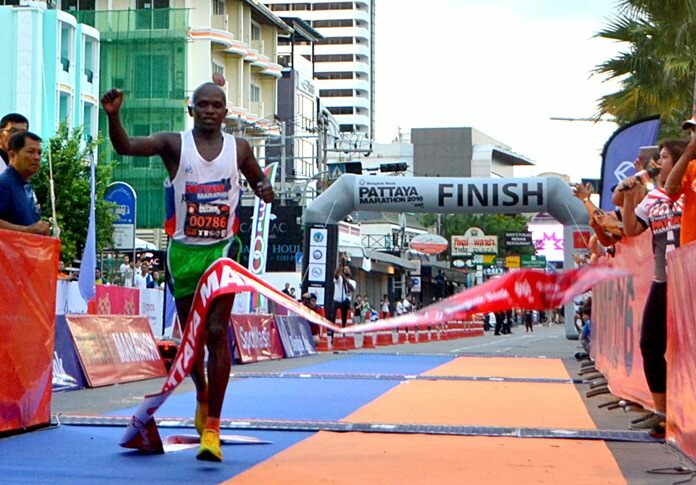 Kenya’s Noah Chepsergon crosses the finish line to win the 2016 Pattaya Marathon, Sunday, July 17. 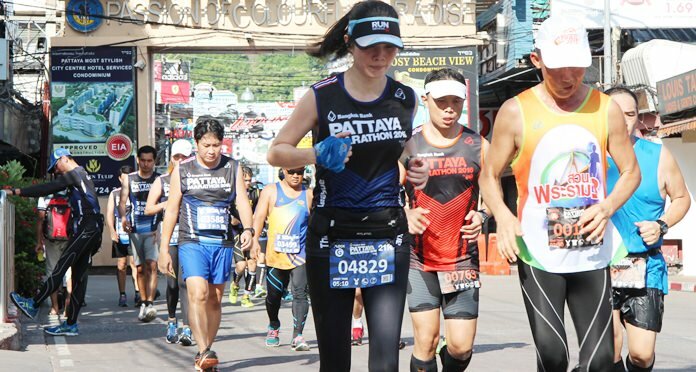 Another Kenyan athlete, Wachira Tabitha Wambui won the women’s marathon in a time of 3:10:11 and was followed over the line by Thailand’s Parichat Sathirasart (3:38:50). 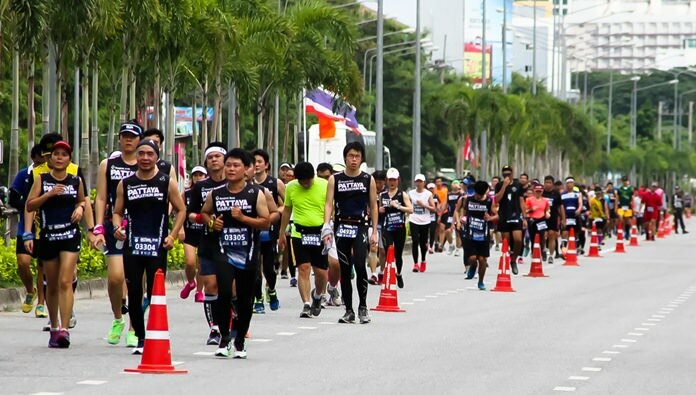 The African dominance continued in the men’s half marathon which was won by Kenya’s Alex Melly in a time of 1:11:39 while the women’s half marathon saw Thailand’s Thanaporn Asawongcharoen fly the flag for the host nation as she crossed the line first in 1:31:44. 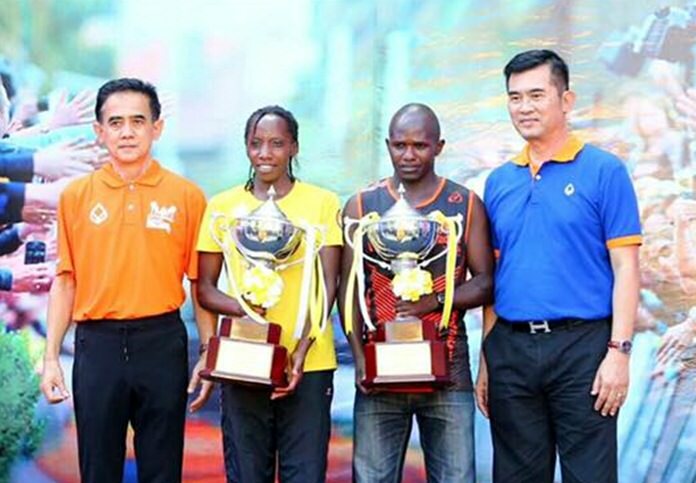 Noah Kutung Chepsergon and Wachira Tabitha Wambui are presented with the prestigious King’s Cup trophies after winning the men’s and women’s marathon races respectively. 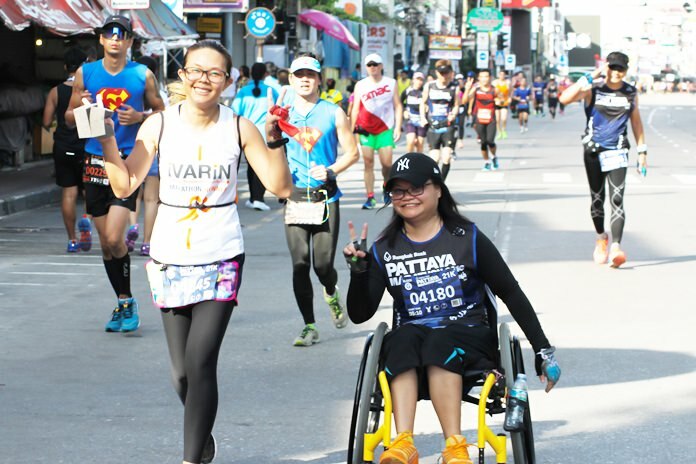 Thai athletes were also crowned champions in the remaining categories as Natawat In-oom (36:33) won the men’s quarter marathon, Suwaree Thanaeknithiwat (43:21) took out the women’s quarter marathon and Amin Harai (15:21) crossed the line first in the wheelchair quarter marathon. 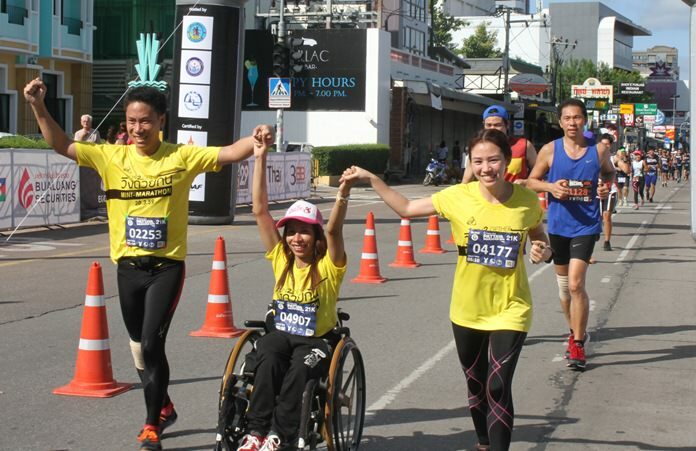 Thailand’s Natawat In-oom celebrates after winning the men’s quarter marathon. 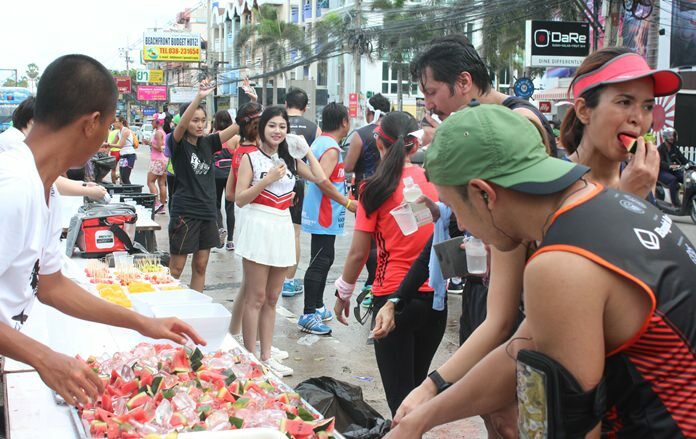 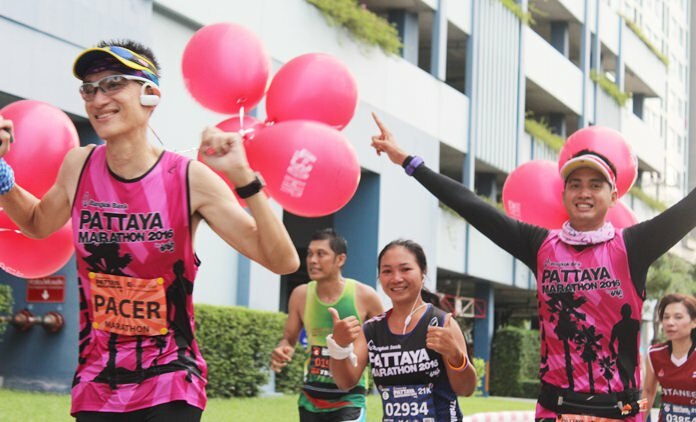 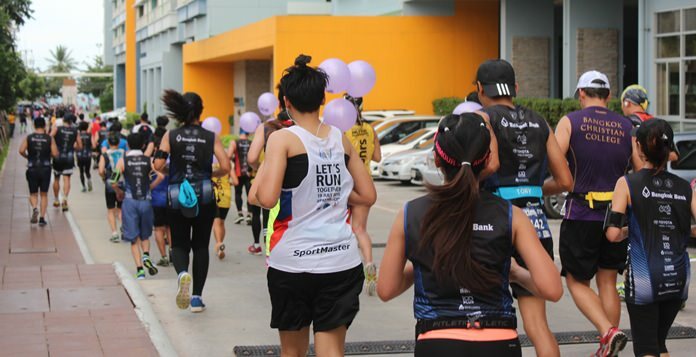 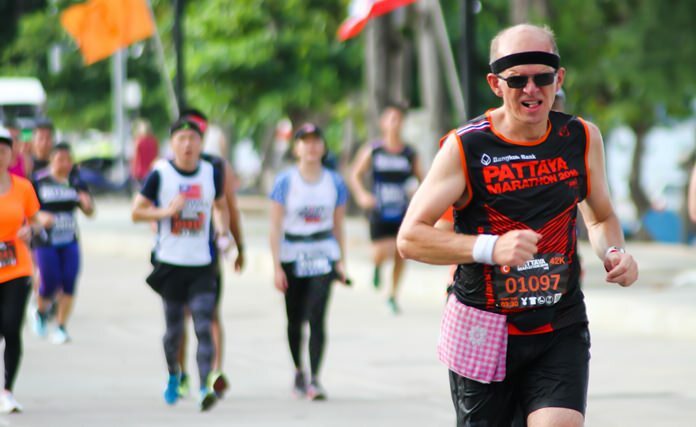 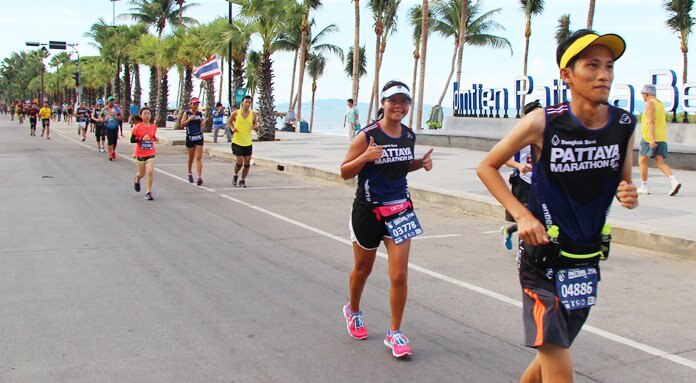 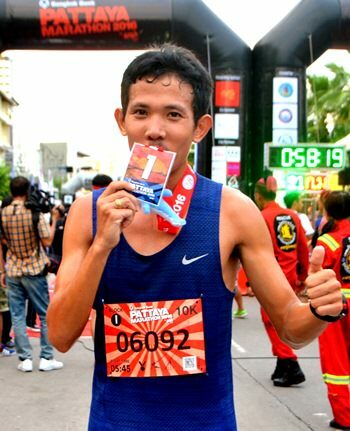 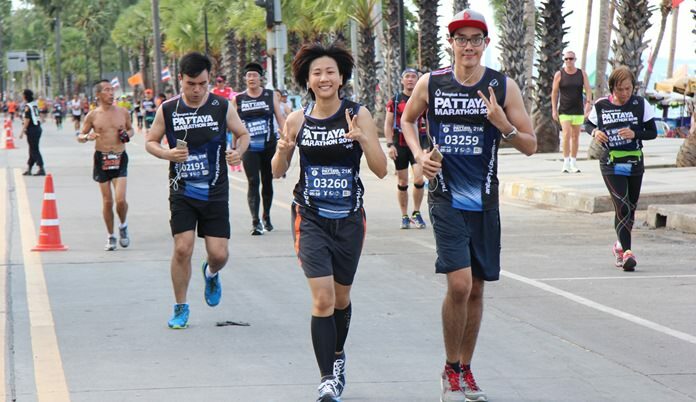 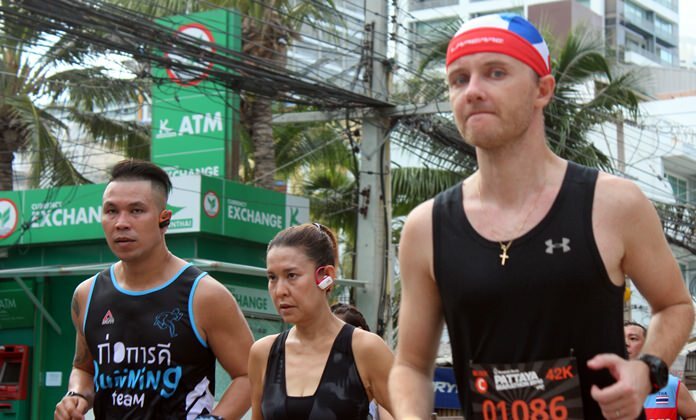 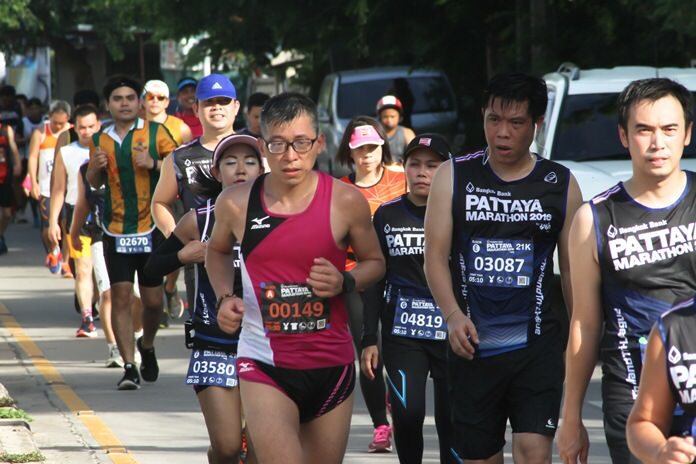 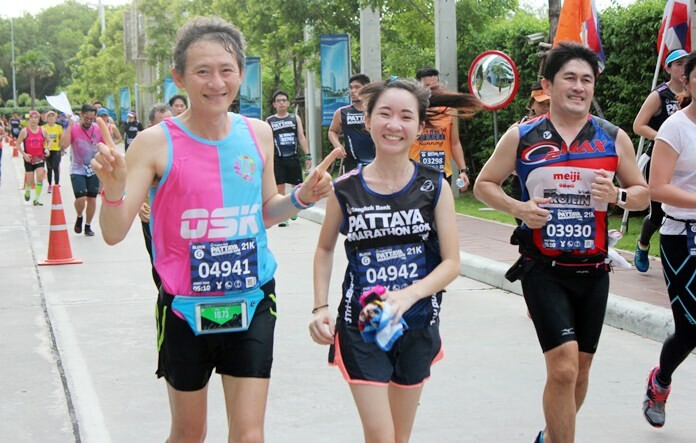 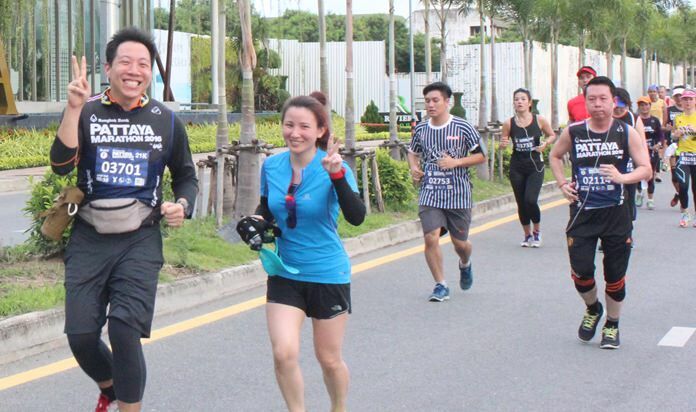 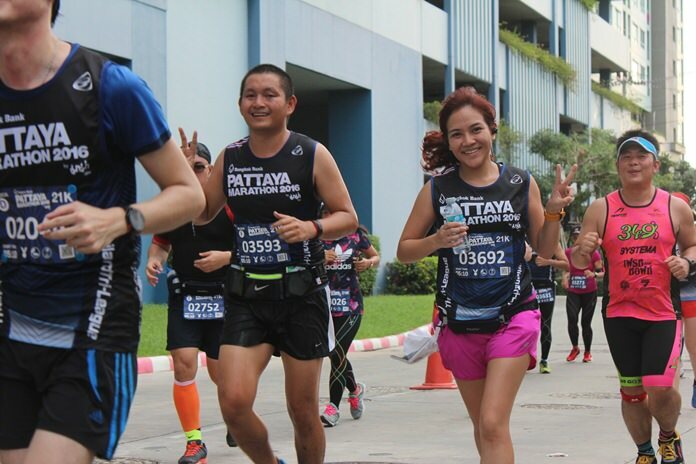 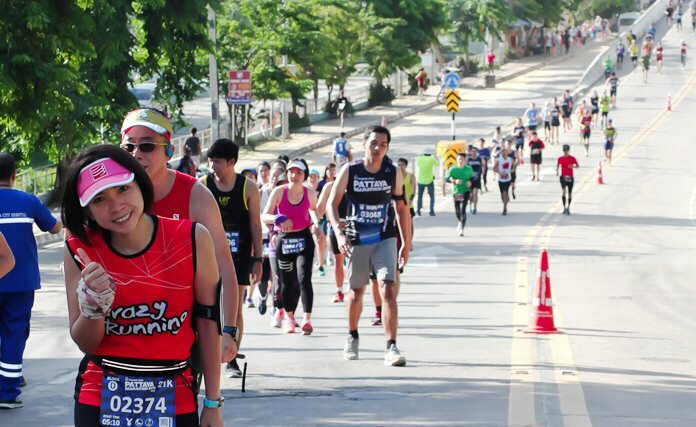 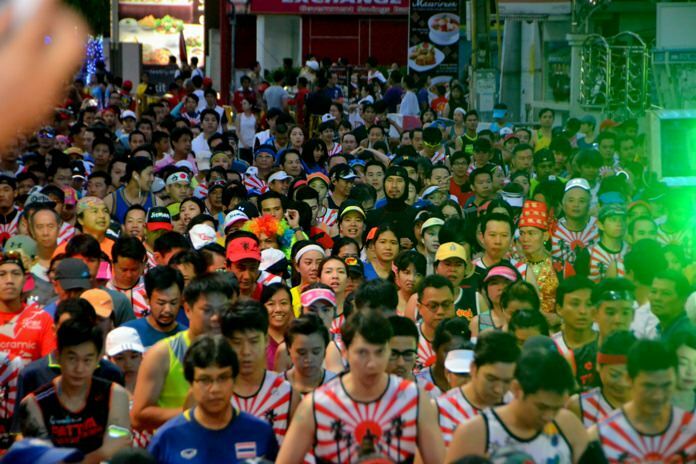 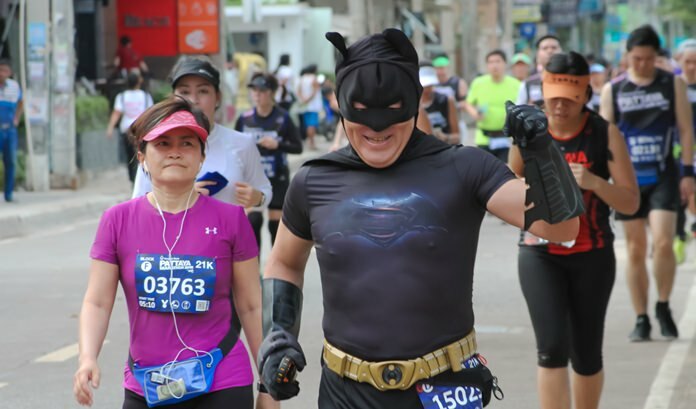 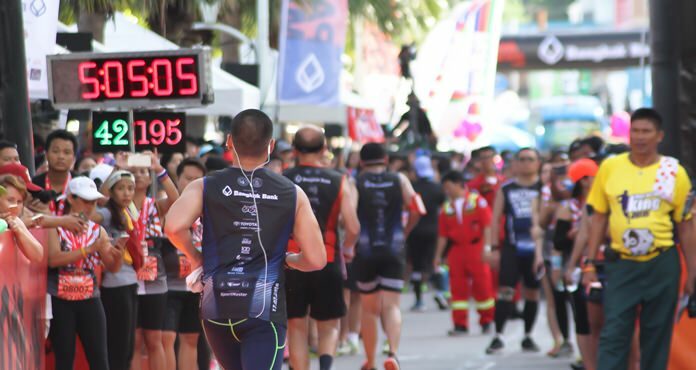 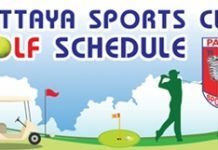 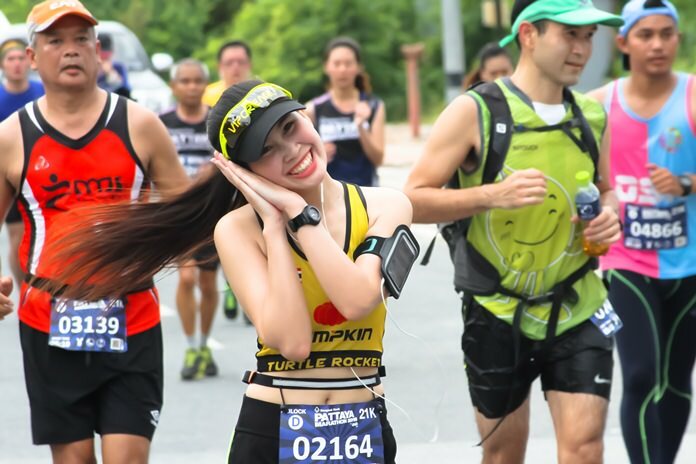 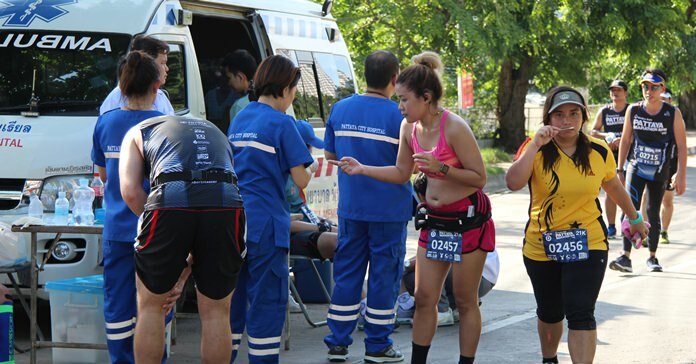 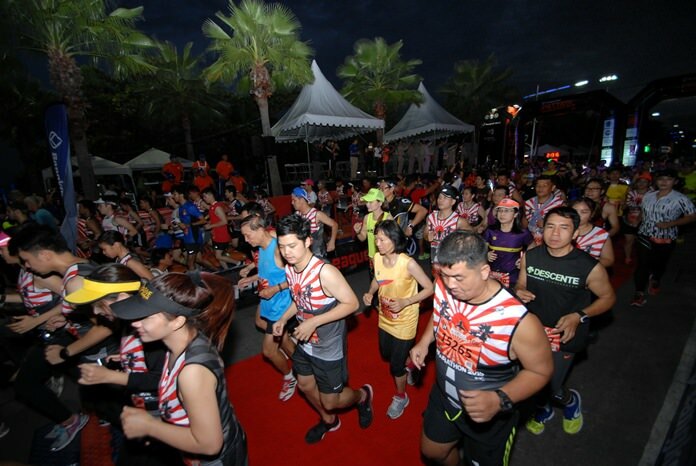 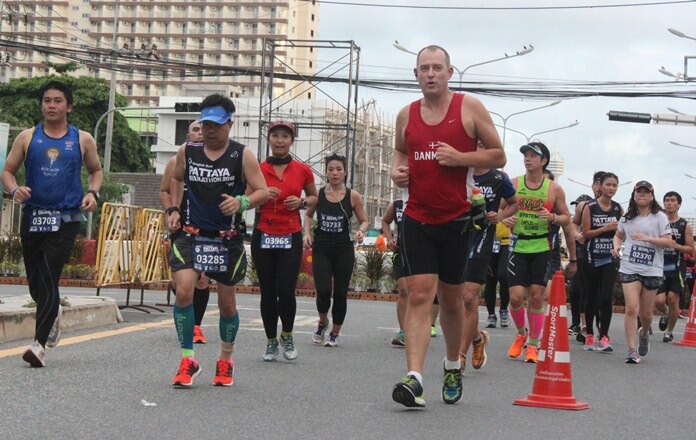 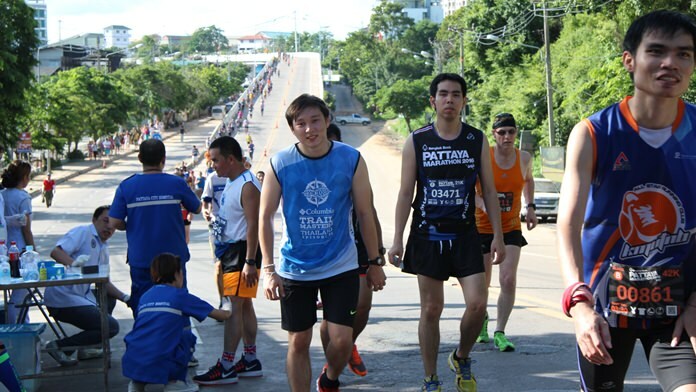 This year’s Pattaya Marathon, held in honour of HM the King, once again proved to be a great success and furthered the city’s claims to be the nation’s number one sports and tourism destination by the sea. 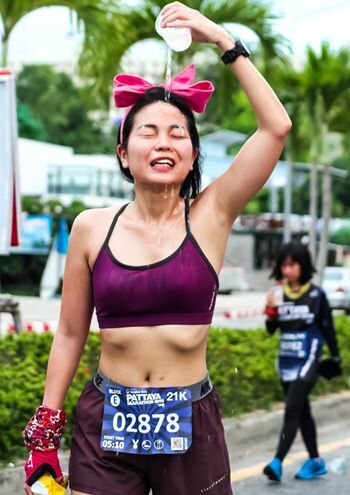 A young athlete tries to cool down after a hard race.